← Wed 25 July: 2nd anniversary of release of Afghan War Diaries. Call for action everywhere. 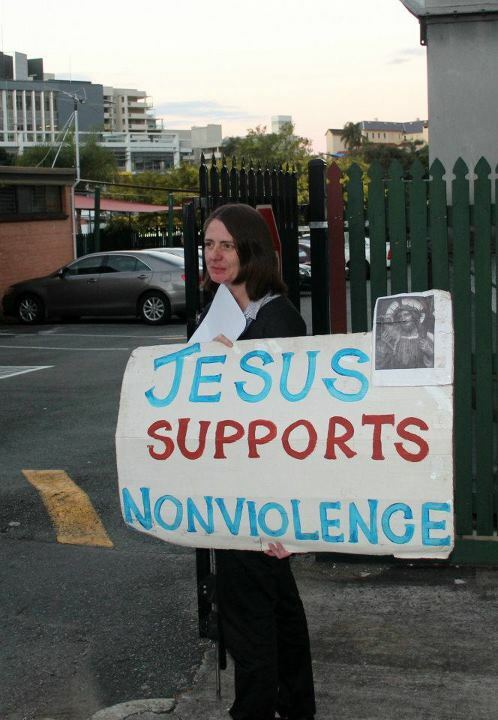 Members of the pacifist Catholic Worker movement conducted an anti-war vigil outside the gates of St. James College, Fortitude Valley, Brisbane on Monday in opposition to Gen. Cosgrove giving the opening speech at Catholic Education Week. 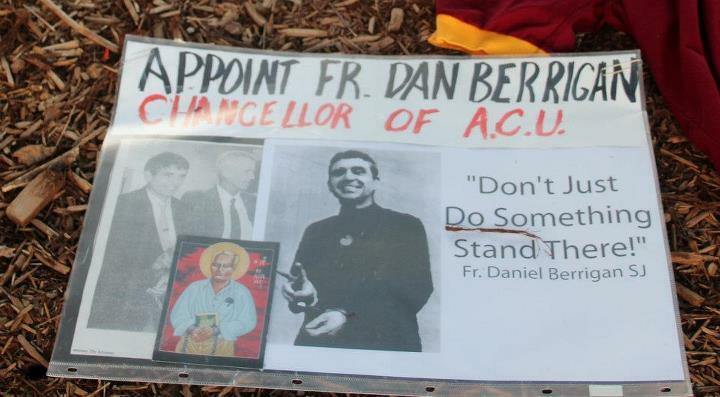 Catholic Workers had previously protested in 2010 outside St. Mary’s Cathedral in Sydney at a mass conducted by Cardinal Pell celebrating the installation of General Cosgrove as Chancellor of Australian Catholic University. 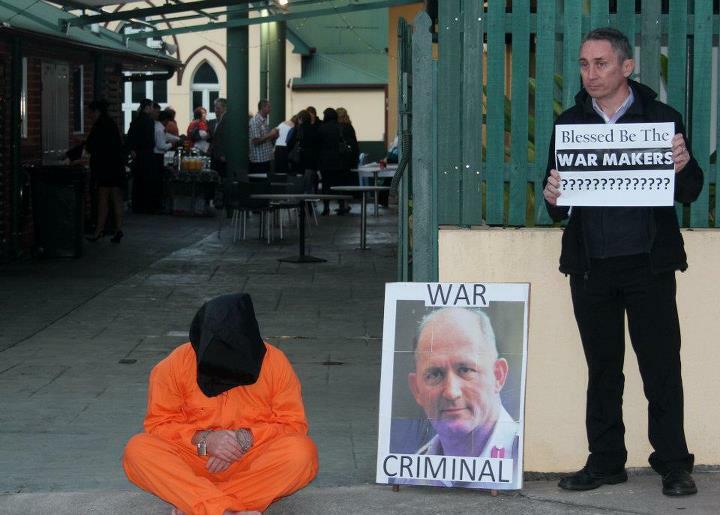 On that occasion, a simultaneous protest vigil was also conducted at St. Stephen’s Cathedral in Brisbane, with Catholic Worker Sean O’Reilly speaking out on the steps of the Cathedral. 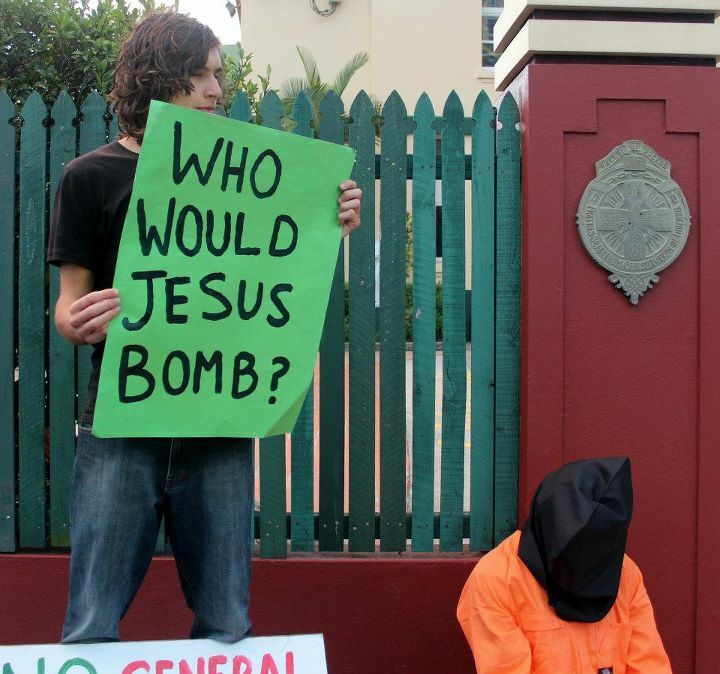 Last Monday’s anti-war vigil at the gates of St. James College, Fortitude Valley, Brisbane was preceded by a “Radical Rosary Mystery Tour”. The tour commenced at the Fortitude Valley site of the 1973 Whiskey Au Go Go nightclub firebombing massacre. The mass murder was the largest killing of white Australians in history at the time. Catholic Workers read the names and ages of the slain: Darcy Day (22), Paul Zoller (18), Colin Folsier (19), David Green (19), Leslie Palethorpe (20), William Nolan (22), Peter Marcus (23), Jennifer Davies (17), Fay Will (19), Wendy Drew (24), Carol Green (27), Desma Carroll (29), Brian Watson (32), Desmond Peters (31) and Ernest Peters (50). The slaughter was an expression of the long term co-operation between corrupt members of the Queensland Police Force and criminals in the red-light Fortitude Valley district of Brisbane. Catholic Workers reflected that this retail scale of murder and corruption expressed in the Whiskey Au Go Go slaughter was echoed and multiplied in wholesale proportions in the Australian war effort on Iraq led by General Cosgrove. Barbara McCulkin (34) and her daughters Vicki (13) and Barbara (11) who were kidnapped and murdered to secure the coverup of the Whiskey Au Go Go massacre were also named and remembered. Bradley Manning and Julian Assange who are paying the price of exposing the wholesale slaughter, firebombing and coverups of the war on Iraq were also named and remembered in prayer. To the best of anyone’s knowledge, this is the first commemoration of the Whiskey Au Go Go slayings; there is no plaque or any other marker where these 15 innocent people were burnt to death on the orders of the authorities. As the Catholic Workers progressed towards Gen. Cosgrove’s opening of Catholic Education Week at St. James school, they stopped in prayer and reflection at historic sites of sorrow, joy and glory. 4ZZZ Community Radio station, Centenary Park where 1960s Speakers’ Corner hosted the beginnings of the anti-Vietnam War movement were visited. The statue of Scotland’s Robbie Burns saw the recitation of the bard’s famous attack on those of high status “A Man’s A Man for A’ that”. 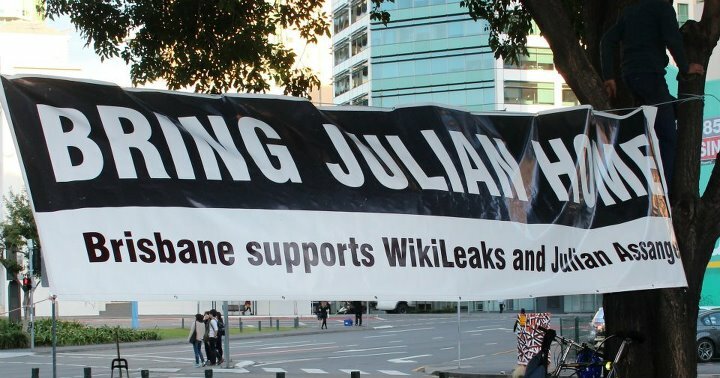 The Catholic Workers then occupied a sizeable traffic island near the school creating an anti-war shrine and hanging banners from the trees calling for the freedom for WikiLeaks’ Julian Assange and Bradley Manning. 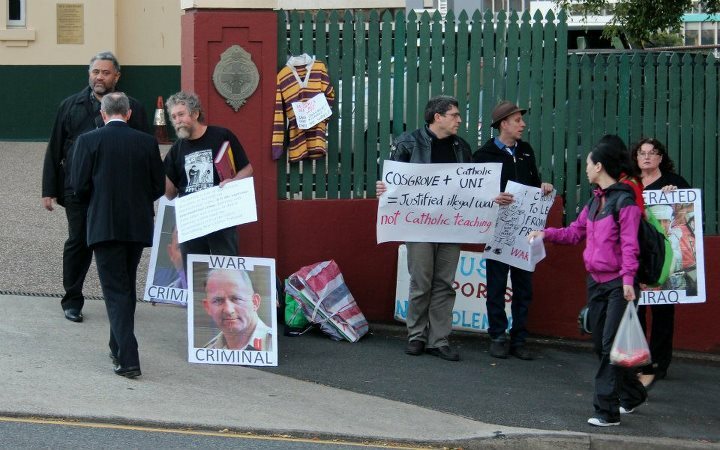 Most of the 15 activists then deployed to the three entrances of the school to engage those organising and attending the Gen. Cosgrove event. 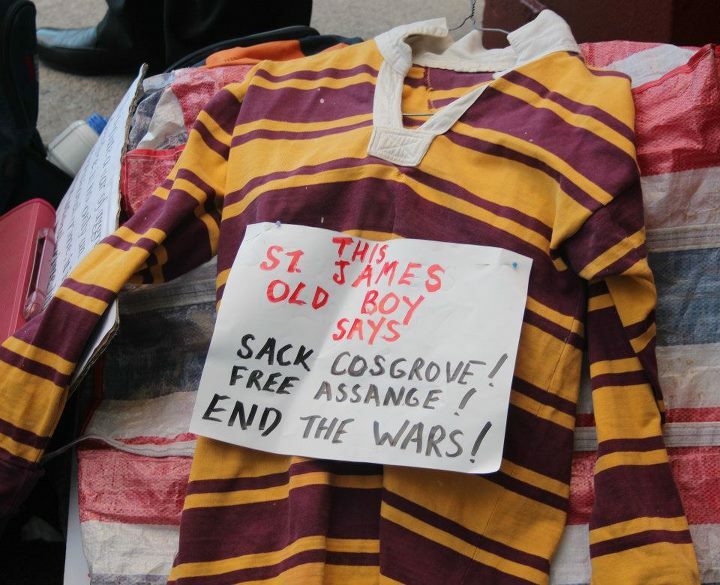 Those conducting the anti-war vigil calling for Gen. Cosgrove’s resignation included parents of children at Catholic schools, nurses, teachers, and former old boys of St. James. 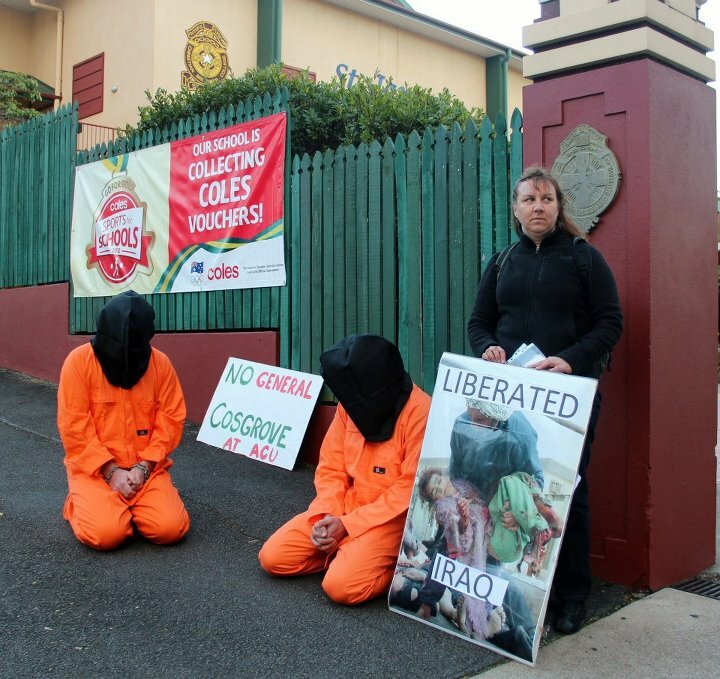 If General Cosgrove wishes to be a Catholic educator he needs to repent the war on Iraq. The general led Australian forces into an illegal and immoral war that the Pope opposed as did most Australians. The invasion of Iraq resulted in over a million deaths, mostly women and children according to the Lancet Report. It also created 2 million Iraqi refugees and 2 million internally displaced Iraqis along with horrific injuries and destruction of civil infrastructure. Although a handful of people and corporations profited greatly from the war, millions continue to suffer. The war is not over for the people of Iraq, the damaged veterans, Bradley Manning and Julian Assange who face a lifetime of imprisonment for exposing the nature of that war. See also this article by Jim Dowling. 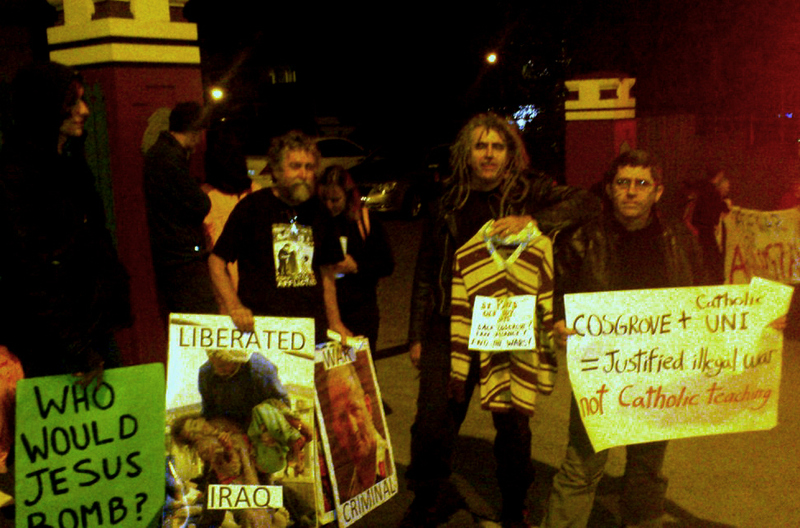 Gallery | This entry was posted in Assange, Manning, Reports and tagged anti-militarism, anti-war, Australia, Bradley Manning, Brisbane, Catholic Worker, commemoration, Julian Assange, solidarity, vigil, Whiskey Au Go Go, WikiLeaks. Bookmark the permalink. This is wonderful, thank you all. Thanks for letting us know and many apologies. This has been corrected now.